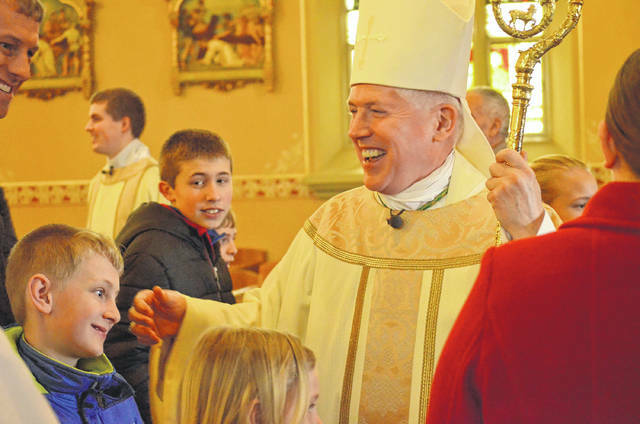 Bishop Daniel Thomas, of the Toledo Diocese, greeted students, faculty and staff of Delphos St. John’s schools after leading a special all-school mass Friday during his biennial visit. Bishop Daniel Thomas leads a special all-school mass at Delphos St. John’s school Friday. After the mass, Thomas held a question and answer session with junior and senior students in the auxiliary gymnasium at the school. 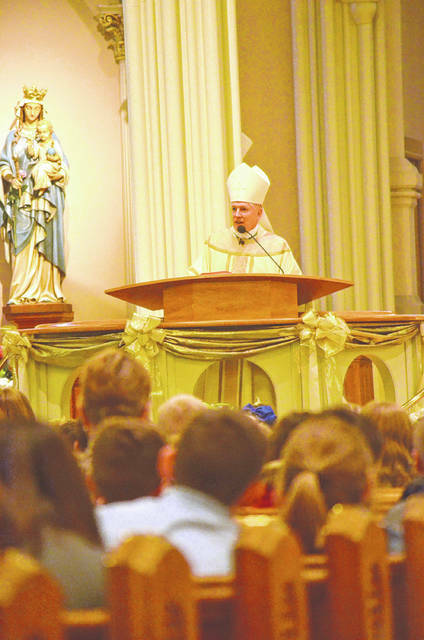 DELPHOS — Bishop Daniel Thomas, Bishop of the Toledo Diocese, held a special Easter all-school mass with the students of Delphos St. John’s Friday and a answered questions presented to him by the juniors and seniors during his biennial visit. “I’m delighted to visit the Blue Jays at St. John’s and to celebrate this all-school mass, with all of the children from the school from K-12, to announce the risen Christ, Jesus, and the Gospel that is announcing Easter,” Thomas said. High School Principal Adam Lee said Friday all-school mass occurs only during special events and when Thomas comes to visit the school. During the mass Friday Thomas gave an Easter-themed sermon concerning how the disciples had returned to being fishermen until Jesus appeared before them after being resurrected. At that time their lives were changed forever as each persons’ life in the present is changed by Easter and he was trying to help the students understand that importance with the sermon, he said. Thomas said it’s important to him to visit all 14 schools in the Toledo diocese so he can hear the concerns of the students and offer them guidance where he can. He visits each school once every other year, he said. Lee said visits from the bishop have always been an important event, and one the students look forward to. During his visit juniors and seniors get time to speak directly to Thomas during a question and answer session. Cole Reindel, St. John’s senior, said they each wrote a question on a a card beforehand so they were not standing in front of the bishop trying to formulate a question in the moment. Jessica Odenweller said she was looking forward to the question and answer with Thomas because it gave her a chance to learn something new from a source other than the classroom and books. Reindel said since the seniors were graduating this year Thomas’s visit was more important than any of them understood until that moment.